He stirred the "breadcrumbs" but would not touch the sprouts. 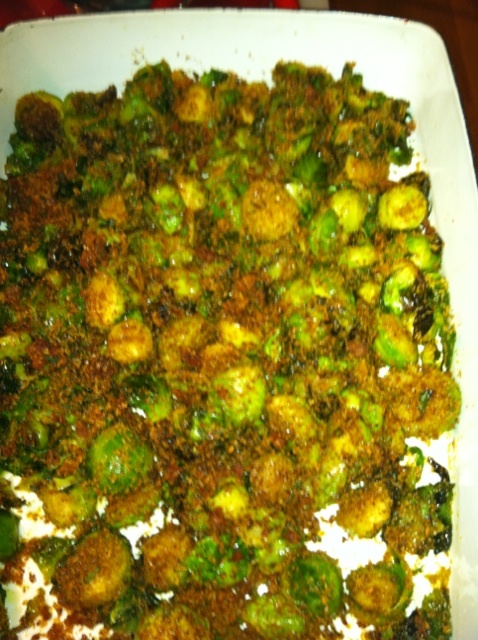 Some trends have emerged from our two most recent Nancy Silverton meals. See if you can spot them. Time consuming? Very. 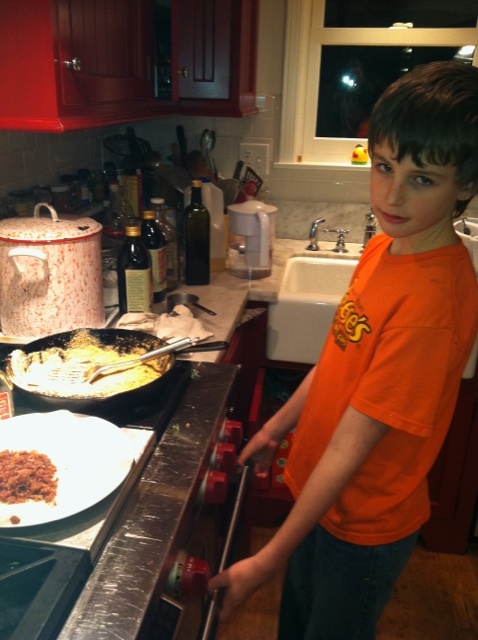 A lot of chopping and whisking, many bowls and skillets and much subsequent dish washing. Olive oil called for: 2 1/2 cups plus 2 tablespoons. Notes: The hanger steak (a cheap and tasty cut) was fabulous. The balsamic marinade: brilliant. 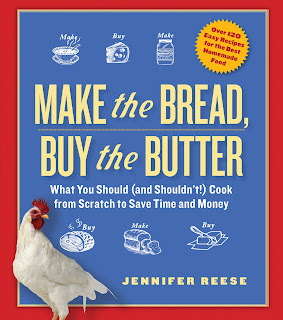 Make this recipe, which you can steal right here though I still think this is a book worth purchasing. Time consuming? Very. Marinating then stuffing then skewering the quail, then wrapping them in pancetta, then grilling, then plating the wee birds and then garnishing them with grilled radicchio and deep fried sage will make you wish you'd just bought a rotisserie chicken. I bet they look better at Mozza. Notes: As a bird that lives in our neighborhood, I find quail adorable. As a foodstuff, I find quail silly. They are too freaking small. 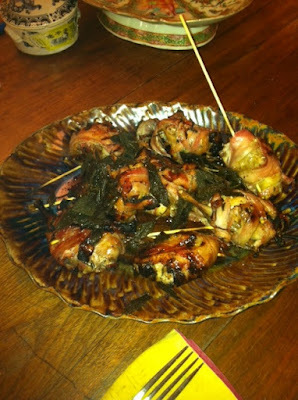 You stuff a quail with pancetta then wrap it in pancetta and what you're eating is pancetta. Good luck finding a bite of bird meat. For that you need tweezers, a crab fork, and your glasses. 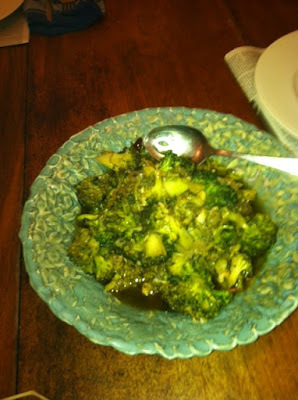 As for the broccoli, I found it sodden with olive oil. I guess last night's dinner was a bust. I'm sure these dishes are great when you order them at Mozza, but they were not great as prepared by me. Would you like some broccoli with your olive oil? Did you spot the trends so subtly highlighted in this post? Bravo! You are very perceptive. I love the line about the faint odor of fish. So very true. I think I would rate quail as closer to rabbit than squirrel or raccoon on the continuum of neighborhood wildlife I would eat. But that's not saying much. Way too much olive oil for my taste. What I wanted to make when I looked at the book, which I haven't bought yet, are what I understand are some of the restaurant's signature dishes -- the meatballs, the pizza, and the butterscotch budino. I don't have prayer that you'll make the latter, but I'd love to hear your opinion of the others if you get around to them. 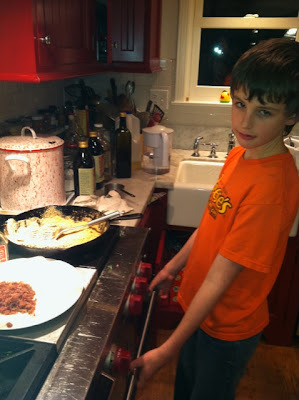 Meatballs and pizza are on the agenda. Oven being fixed today. Kristin -- that looks GREAT and I will definitely avail myself of the supermarket peeled garlic to make it. It looks like your recipe will avoid the problem I had with the Silverton recipe -- at least as read and interpreted by me -- which was that it became too oily. The broccoli and olive oil seemed to merge. I think I cooked it too long. Thank you. I will report back. Jennifer, I finally read your book, and it was terrific. It read like a story and I was so sad that it ended. The good news is that my 10 y.o. daughter enjoyed the excerpts I read aloud, so she is going to read it. I am pretty sure she'll go straight to the dessert section and make Isabel's cookie recipe and the cake and frosting recipes. Thanks so much-I hope you have started the next book. I got your book for Christmas and it is one of my favorite presents!